Angry Birds and Pigs have taken the world by storm. Kids all over the world, especially boys love this crazy characters. If your little boy likes barn yard animals, you can be sure they will love having their rooms decorated with these popular characters from this hit movie and video game franchise. Regardless to which character is his favorite, you can find a bedding set that will highlight his favorite angry character whether it is the "Mighty Eagle", one of the birds or one of pigs. 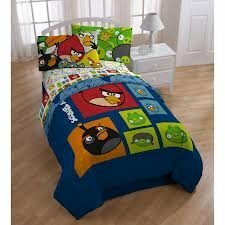 Your son will love having any one of the many Angry Birds bedding set as the focal point of his bedroom decor. This complete bedding ensemble includes a comforter, a fitted sheet, a flat sheet and a pillow case. The dimension of the twin comforter is 86.0 inches Length x 64.0 inches in width. You can wash this bedding set in a machine using cold water only. Also, care directions dictate that you only use the tumble dry option. The sheet fiber content is 60% cotton and 40% polyester, while the comforter is made of 100% polyester. This complete bedding ensemble is sold and shipped by Glitter0283. The pillow case has a big angry bird print with a white background. The big red angry bird is surrounded by black, yellow and white birds. It has all the characters of the hugely popular video game and movie. The red angry bird print and the ‘green pigs’ makes the comforter set very attractive and will bring your childs room to life. You can get this complete bedding ensemble for under $70. This Angry Birds Twin Comforter with Twin Sheets features one ‘angry birds’ twin comforter, flat and fitted sheets and pillowcase. The complete set is machine washable and easy to care for. The comforter set has the loveable characters printed on top of a light blue background that enables it to brighten up your child's bedroom regardless of the wall paint and other accessories. The pillow case has the wording ‘Angry birds’ printed on it. This comforter set is made of microfiber which makes it extra soft, warm and cozy. This is a great gift for fans of these crazy birds and pigs and because it is made of microfiber, it is very easy to clean. You can get this twin comforter and sheet ensemble for under $60 when it is on sale. This Angry Birds Full Comforter Set has a reversible comforter, two pillow shams and a bed skirt. Because boys are usually very rough on their things, so having a reversible comforter is very cost effective. This vivid comforter set has fitted and flat sheet as well. 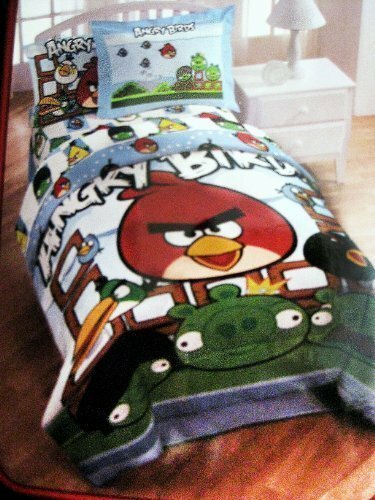 The comforter set perfectly depicts ‘Angry birds’ and the pigs with a closeup of "Red" bird on the comforter. Because this comforter set is so animated with it's bright, vivid colors and huge life like characters, this set would really appeal to younger boys from 3 to 6 years old. The pillow case features four tiny red angry birds and three green pigs. The pillow case also has “Angry Bird” written on the front. The other pillow sham has different Angry Birds pictures printed on it. Angry Birds Full Comforter Set is a complete bedding set to help complete your little boy's bedroom decor. 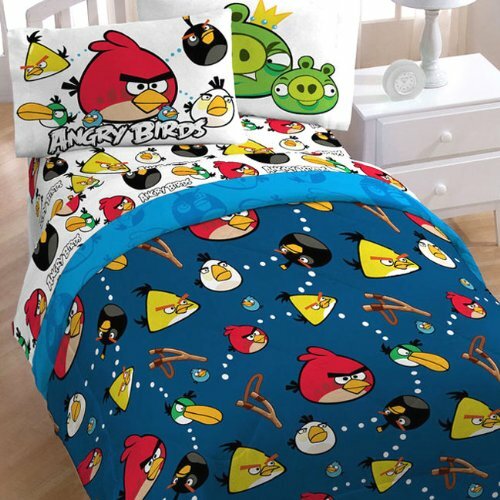 Angry Birds Twin Microfiber Comforter will be a special gift for your special boy. This comforter is sold and shipped by Netkidswear. The fiber content is 100% polyester. Angry Birds Twin Microfiber Comforter is filled with 100% polyester content. The Microfiber provides ultimate soft, fluffiness and warmth. The dimension of the twin comforter is 86.0 inches Length x 64.0 inches Width. You can wash this bedding set in a machine on the cold water cycle and tumble dry. Avoid bleaching agents and harsh chemicals on this Angry Birds Twin Microfiber Comforter set. This particular comforter set is a very "busy" print, which makes it fun and will bring out the "kid" even in kids. The red angry birds and green pigs printed on dark blue background and with all the bold, bright colors in this bedding set, it can pretty much match with any wall color or floor accessory. The pillow case has two big green pigs bring along with a big red angry bird with a white background. 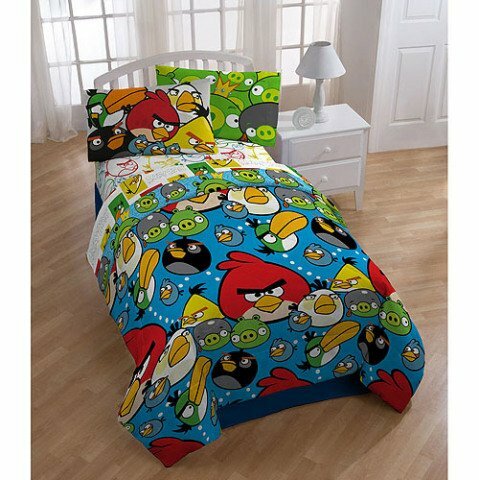 If you are looking for a cheap ‘Angry Birds’ twin comforter then Angry Birds Twin Comforter from Classy Joint will be the best choice. Angry Birds Twin Comforter features a big red angry bird print and the ‘Angry Birds’ wording on the light blue background. This comforter set will brighten up your son’s bedroom as the comforter is light blue. 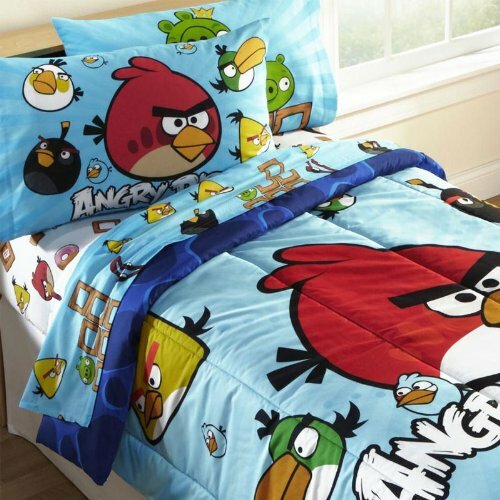 Angry Birds Twin Comforter is made of 100% polyester and it is machine washable in cold water. This comforter should always be tumble dried. The dimension of the twin comforter is 86.0 inches Length x 64.0 inches Width. This bedding set is suitable for kids over 3 years of age. Angry Birds Twin Comforter is very soft and comfortable. You can get this comforter alone for under $30 if you are not interested in getting the entire set. This Angry Birds Twin Comforter Set with Twin Sheet Set is from Urbanity Trading. This comforter set is from genuine licensed merchandise. The set includes one Angry Birds twin comforter, flat and fitted sheets, and pillowcase. The comforter set features a big red angry bird surrounded by yellow, green, black birds. The background of the comforter is light black which really allows the pictures of the different birds to pop.